In a medium pot boil water and add potatoes. Cook for 8-12 minutes or until potatoes are tender. 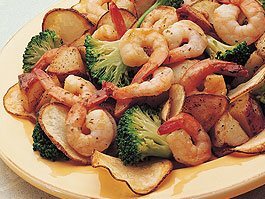 In a large skillet, cook shrimp scampi and broccoli over medium-high heat for 3-4 minutes. Add potatoes and saute for additional 2-3 minutes until shrimp turn orange on the outside and opaque white inside.